Feeding corn is legal in Door and Kewaunee counties, with some restrictions. Learn more at dnr.wi.gov/topic/hunt/bait.html. DNR photo. A brutal winter is taxing some wildlife species, and we’re not out of the woods yet. For the first time since 2013, deep snow and extended cold threaten to trim some deer and wild turkeys from the landscape. The good news: It was a fairly easy start to the winter, and most of the wild creatures came into it in very good shape. The bad news? There’s no major thaw in the forecast; the next mid- to upper 30s aren’t expected for another 10 days; and a heavy snow is possible right after. If the thaw is an extended one, conditions could improve fairly quickly. But if we get cold nights and snow events into April (like last year’s freak storm), wildlife could take a major hit. Farm-country deer and turkeys go into the winter in far better shape than their big-woods counterparts. The northern forest regions could see some significant starvation and predation on weakened deer if March is a lion. Here on the Kewaunee/Door peninsula, last year’s fawns and adult deer that have been weakened by age or injury are the most likely whitetails to die. Many farmers and landowners provide an assist by leaving some crops or food plots standing, or cutting some trees so deer can browse on the branch tips. If you’ve been providing corn and other treats all winter, you’re likely seeing a lot of deer, turkeys and other wildlife such as pheasants. However, if you haven’t been doing so, it’s not recommended you start now in areas where deer have not had access to corn because their digestive systems can’t handle it. Hundreds of Door and Kewaunee County hunters and wildlife lovers buy bags of wildlife feed from area mills and other businesses. 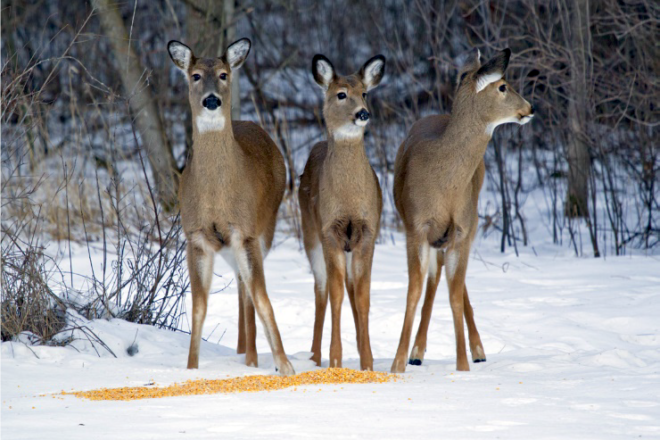 See the rules on feeding and get more information at dnr.wi.gov/topic/hunt/bait.html. Better yet is creating and improving habitat to give deer and other wildlife the resources they need throughout the year. Winter hinge-cutting, for example, provides natural cover and nutritious browse. Landowners can get more habitat-improvement tips at dnr.wi.gov/topic/Landowner/. It’s tax time, and that means citizens can help endangered wildlife in Wisconsin by donating to the Endangered Resources Fund on their Wisconsin income-tax form. The tax-time contributions provide about 25 percent of the funding for work by the DNR’s Natural Heritage Conservation staff, partners and volunteers to protect and restore Wisconsin’s rare wildlife, plants and State Natural Areas. Bald eagles and trumpeter swans are the most famous wildlife that benefit from the fund. Although you can no longer “look for the loon” – the traditional slogan and icon in the donation section of the state tax form – you can still gift a portion of your tax return to the fund. Your gift is tax-deductible and matched dollar for dollar. The area occupied by monarch butterflies in the mountains of central Mexico is more than double of what it was last year, and the most in 12 years. The butterflies are impossible to count, but there are millions, often including thousands packed on a single tree branch. The total occupied land this winter was 14.9 acres, up from 6.1 last year and a huge increase from just 1.6 acres five years ago. Good weather conditions during the breeding and migration seasons, plus habitat-protection and restoration efforts, have helped fuel the increase. Visit the Wisconsin Monarch Collaborative website at wiatri.net/Projects/Monarchs/habitat.cfm to learn how you can help monarchs. The DNR has updated guidelines for managing ash stands in light of the invasive emerald ash borer (EAB). The guidelines reflect new research, increased pest detections and the anticipated transition to a statewide EAB quarantine. The agency also released its 2018 Forest Health Annual Report, summarizing notable impacts of pests, diseases and weather on the health of Wisconsin’s forests. Meanwhile, the Division of Forestry is working with stakeholders to develop Wisconsin’s 2020 Forest Action Plan. You can learn more on the DNR website and sign up for updates on the state’s GovDelivery list. The global Great Backyard Bird Count was held Feb. 15-18, but it is accepting data on its website (gbbc.birdcount.org) through March 1. As of Feb. 25, more than 192,000 checklists had been submitted, totaling more than 30 million birds and more than 6,500 species. Overall, there were 2,641 checklists submitted in Wisconsin, and 116 species reported. The numbers included 54 checklists and 42 species in Kewaunee County (14th in the state for checklists) and 41 checklists and 37 species in Door County (23rd). As of Feb. 22, Lake Michigan water levels were 50 inches above the all-time February low, set in 1964; and only 10 inches below the all-time high, set in 1986.